Fieldstone Cabinetry’s beautiful Linen finishes feature Latté glazing and speckling for a softer tone, and rounded corners for an heirloom feel. Available in three distinct yet related colors—Linen White, Linen Ivory and Linen Mushroom—there is a Linen finish to use as your neutral in more color palettes than you can imagine! Linen is available on Maple cabinetry. To speckle the Linen finish, a subtle stain is randomly applied across the surface of the finish. These spots will be no larger than the diameter of a pencil eraser. Speckling complements the Latté glaze. 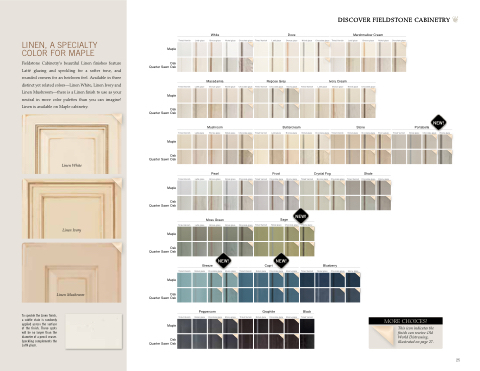 DISCOVER FIELDSTONE CABINETRY Our complete collection of Tinted Varnish cabinet colors is shown below. This icon indicates the finish can receive Old World Distressing, illustrated on page 27.